Third generation HF-L graduate, Eagle Scout, and young entrepreneur, Brad Miller took over the local bowling alley in February 2015. Miller became involved with the bowling alley at a young age; the bus dropped him off at Brongo Bowl after school when his parents were working, and often times Tom Brongo would give him money to spend in the arcade. “I’ve worked here since I was sixteen, I grew up here; Tom Brongo was my dad’s best man, so before I was even born, I was involved,” Miller says. The building became a bowling center in the mid-1940s and has been a memorable part of the community ever since. 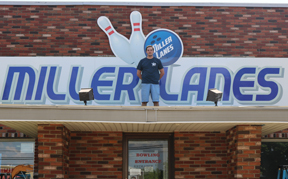 While keeping the spirit of the bowling alley alive, Miller hopes to add a few more games and even a volleyball court to the attractions at Miller Lanes in the next few years. The bowling alley is open seven days a week from September to April and six days a week from May until August, and on Fridays there is cosmic bowling. So, if you’re looking for something fun to do while staying out of the heat, don’t worry, air conditioning has been a recent addition.